As Isaac navigates the tedium and terrors of prison, forging tenuous trusts, his wife feverishly searches for him, suspecting, all the while, that their once-trusted housekeeper has turned on them and is now acting as an informer. And as his daughter, in a childlike attempt to stop the wave of baseless arrests, engages in illicit activities, his son, sent to New York before the rise of the Ayatollahs, struggles to find happiness even as he realizes that his family may soon be forced to embark on a journey of incalculable danger. 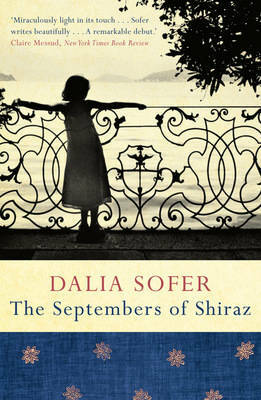 'A remarkable debut ..."The Septembers of Shiraz" is miraculously light in its touch, as beautiful and delicate as a book about suffering can be' - Clare Messud, "Scotsman". '"The Kite Runner" became a global best-seller not just because it removed the lid on a troubled country and exposed the human stories within. Dalia Sofer's debut has the potential to do the same ...Sofer's touch sometimes feels so weightless, you wonder if it can bear the brunt of her hefty subject. Yet she also tells a difficult story effortlessly, illuminating a moment in history through the prism of something universal' - Clare Allfree, "Metrolife". 'Brave, thoughtful and accomplished, Dalia Sofer's novel explores questions of privilege, loss, identity and allegiance with a lyrical wisdom' - "Observer".